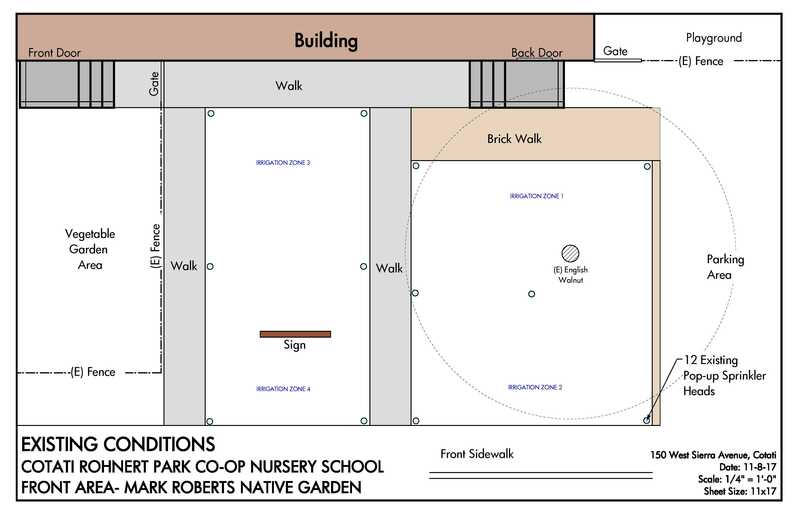 I met with the board last night to discuss a volunteer project to re-landscape the Mark Roberts native garden beds at the entrance to the school. Sherry and I have been discussing this work since last year. I own a landscape firm in Petaluma and would coordinate the work and solicit donations to the school of required materials at no cost. The board voted to move forward and discuss in more detail next week at our parent club meeting. 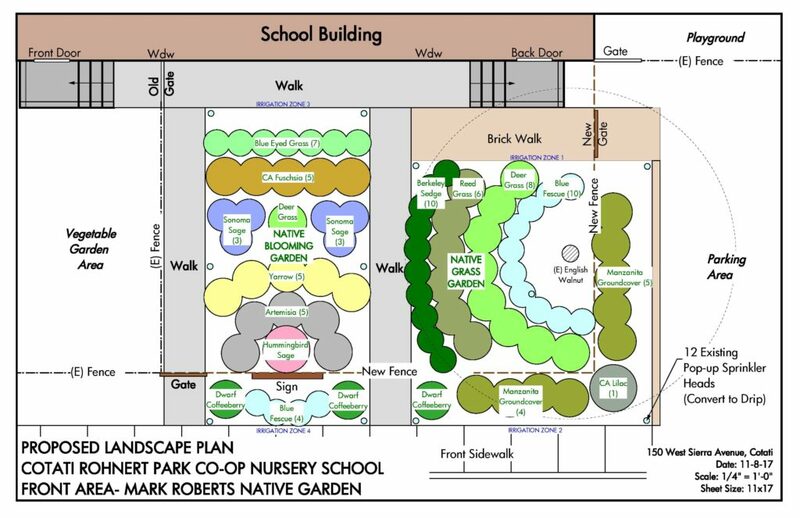 I hope this will be a nice enhancement to the front of the building and be a good educational demonstration of native plants. Planting Overview: The new plantings would be divided into two themes for the existing planter beds. The section under the Walnut tree near the parking lot would be a native grass garden and would feature Deer Grass, Berkeley Sedge, Blue Fescue, and Reed Grass. The section closer to the front entry gate would be the blooming section. Plants here would be low maintenance native perennials featuring California Fuchsia, Artemisia, California native Sage varieties and Yarrow. At the sidewalk lower groundcover plants would replace the existing shrubs, which have become overgrown. You can read more about the plants to be installed in the Plant Palette PDF. Install botanical signs giving the common and latin names of newly installed plants. Fencing Phase: The second phase would be to install a new extension of the perimeter fence to encompass both entry walkways from the front sidewalk, all the way to the parking area. This would have the benefit of enclosing the entire front of the school in a secure yard area and has been on Sherry’s wish list. As part of this work, the existing sign would need to be either relocated closer to the street, or replaced with a higher visibility sign that would face West Sierra Avenue. Timing: Work would take place over winter break and be completed either sometime in December or January. I estimate 3-4 volunteer days being required for the planting phase, depending on the number of volunteers we have. I look forward to discussing this more next week.